StitchyDonDesigns: Lots of Smalls !!! Now I finished Christmas Pudding I want to keep some Smalls in my rotation to pick up in the evenings when I've had a long day at work and can't focus on my owl project. 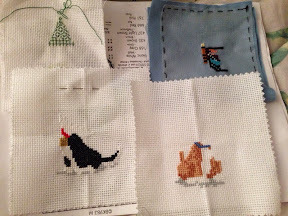 I took the last three Smalls from my Crazy January Challenge and added a kit from an old issue of Cross stitcher to my stitching tin. What I am doing is spending an hour a day roughly on them rotating them on a daily basis. The kit is a butterfly stitching on soluble canvas to a piece of Wedgwood blue fabric. I have never used soluble canvas before. It's a strange one, I quite like how it is turning out but I don't think my ocd can handle how the stitches aren't always regular haha !!!! It is supposed to be made up into a coin purse which I probably won't do but I am enjoying doing something different !!! !